We’re already carrying enough sensors to report our locations, record videos on the go, and measure the inner workings of our bodies. So the next step seems only natural — tracking the quality of the environment around us, from the air we breathe to the food we eat. That’s the idea behind the Lapka personal environment monitor, a $220 pack of sensor modules that plug into your iPhone, iPod Touch or iPad. The Lapka system is made up of four lead-free, water-resistant pods, each one containing sensors that measure different aspects of your environment: background radiation levels, electromagnetic field strength, humidity and the nitrate levels in organic matter. Simply plug one of the block-shaped sensor modules into your iPhone using the included cable, then fire up the Lapka app and begin scanning your environment. 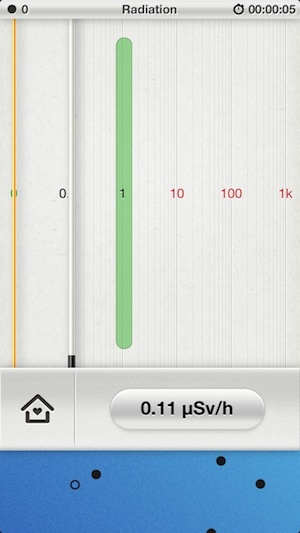 Check the current levels of beta and gamma particle radiation with your iPhone. The radiation module measures the levels of hard beta and gamma particle radiation wherever you are. The EMF module detects high-frequency and low-frequency fields, and the humidity module can measure both temperature and relative humidity. The organic matter module includes a probe you can stick into foods to measure the amount of nitrate nitrogen within. Each sensor has a number of settings you can choose to get the most accurate reading for the environment you’re in. For example, to test the particle radiation levels in your home, you’d connect the radiation module and use the app’s “Home” preset. The measurement standards will be different than if you test the radiation levels on a jetliner with the “Airplane” preset. All data from the sensors is beautifully illustrated in the app’s interface. It’s minimal and lovely, with data rendered in tiny moving particles and soothing colors with inviting iconography. Each sensor is represented by a matching floating block on the screen, and the blocks tumble around as you move your phone. As someone who tries to fill her iPhone only with apps that have the most beautiful UIs, I really appreciated the Lapka’s attention to software design. The app will also assemble a daily diary of the captured measurements using the same simple data-visualization language. The sensor pods themselves are attractive, too. Each is capped by a wood block that has a hole in it — you can thread the braided iPhone cable through this hole, or you can use it to make the sensor into a wearable piece of jewelry. The organic matter sensor is arguably the most intriguing. There’s a stainless steel probe magnetically attached to its base, and you plunge this probe into a fruit or vegetable to detect the nitrate quantities left behind by synthetic fertilizers. There’s a preset list of 10 fruits and vegetables you can test, like melons, bananas and eggplants. There are also a handful of grayed-out choices, so supposedly we’ll get the ability to test a wider variety of produce after subsequent software updates. Each food has a defined limit of nitrate concentration to use as a scale of measurement. Since the Lapka pods are small enough to fit in the palm of your hand, you could, in theory, bring the organic probe sensor to the farmer’s market and poke produce to your heart’s content. You’ll probably piss off a few farmers in the process, but you might also bust a few organic posers. For die-hard organic food fanatics, I can absolutely see the appeal of testing your produce before you buy it. But I doubt most of us would be willing to endure the strange looks from other shoppers. I enjoyed using the Lapka system because the design of both the hardware and the software are beautiful, but I’m not sure how practical it is. After using it every day for about a week, I found myself forgetting about it. If you have no specific reason or motivation to use one of the sensors, chances are you won’t. And at $220, I see Lapka appealing only to people with specific health concerns and interests, or possibly medical and environmental professionals who track this kind of information over time, though they’d probably prefer to use more specialized equipment. In other words, it’s of use only to those who are already making a point to educate themselves about the world around them. Lapka could benefit from going one step further and providing life advice based on the data it measures. It’s great to receive a daily pat on the back for working in an office with low EMF levels, but for my $220, I’d rather be told what to do if my EMF levels suggest I’m sitting on a hotbed of supernatural activity. WIRED Hours of fun measuring the toxicity of supermarket produce. Professional-quality sensors hidden inside attractive cases. Beautiful, easy-to-understand software interface. Compact physical design; take the modules anywhere. TIRED Pricey. Nichey. No real advice on how to take action with the data you’ve collected.